This is a good starting topic. It may be obvious, but its implications may not be. Wheel radius is a term I came up with to relate spin velocity to forward velocity. Wheels come to a complete stop as they come in contact with the ground. At a certain radius a boomerang will also come to a complete stop in midair. That radius is what I refer to as the wheel radius (Rw). 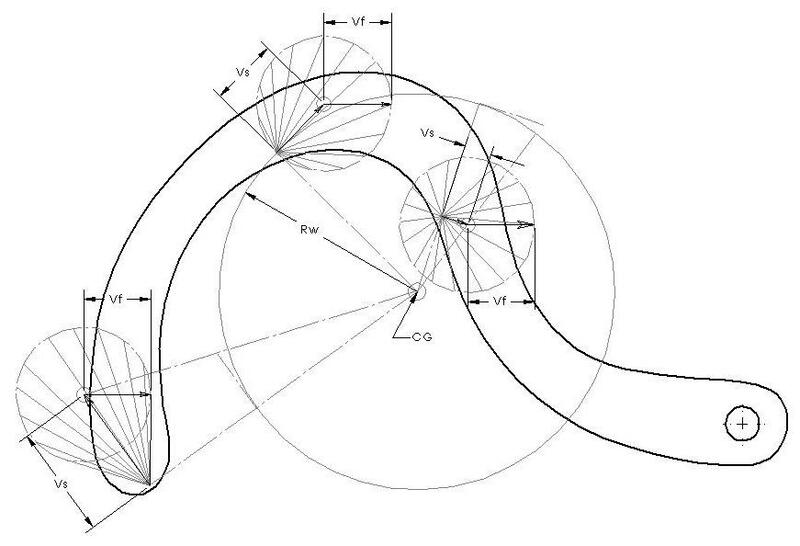 At this radius the tangential velocity (Vs) due to the rotation is equal to the forward velocity (Vf). Vs and Vf line up and cancel each other out when a point on the boom is at the wheel radius and at the lowest point of rotation. while the flow inside the circle is in all directions. Knowing the Rw helps to determine what foil shape to use for each section. Rw constantly changes during flight. On the way out the forward velocity decreases until the boom reaches its highest point then it increases on its way back. The spin velocity slowly decreases over the entire flight. This means the wheel radius gets smaller as the boom goes out and gets bigger again on the way back. The wheel radius will be zero if the forward velocity is zero. At launch the wheel radius is very close to the grip radius. This is because the boom is moving forward very fast and the thrower must stay behind. Remember that the wheel circle is where the forward velocity and spin velocity can cancel each other out. Since the grip point is nearly standing still at the release point then the wheel circle should pass thru the grip point. For this reason the distance between the grip point and the CG will determine the spin rate. If you grip a boom closer to the CG then the spin rate will be higher.